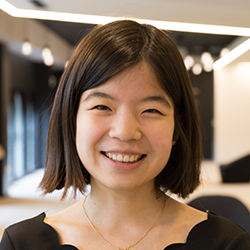 Anne Li is the interactive audio producer at The Washington Post, which means she spends a lot of her time thinking about and talking to Amazon Alexa, Google Assistant and Siri. She currently produces three flash briefings for voice assistants: The Daily 202’s Big Idea, Retropod and Capital Weather Gang. She came to The Post in April 2017 from West Virginia Public Broadcasting, and she is an alumna of the Northwestern University Knight Lab. Li was a presenter on the panel AUDIO: From podcasts to Alexa, Hey Google and Siri, journalism is raising the voice at ISOJ 2018 on Saturday, April 14 @ 5:00 p.m.
Watch video of her individual presentation or panel discussion. Or read an article about the entire panel.